Sharekhan Insta MF platform allows the clients of Sharekhan to invest in mutual funds. In this detailed review, we will see how this is done along with some of the benefits and concerns of using this application. Sharekhan, a leading full-service stockbroker, provides you with various investment and trading services across different financial products including Equity, Commodity, Currency, Mutual Funds and more. In this review, we will talk about Mutual fund investments using the Sharekhan Insta MF Platform. Before we go ahead into the details, we need to know what exactly is Sharekhan Insta MF? Mutual funds market, along with the Equity market, has seen huge growth momentum in the recent past. Talking about some numbers, Mutual funds have seen an investment in excess of ₹5 Lakh Crore in 2017 itself. As far as 2018-19 numbers are concerned, the growth is way higher. This number is only getting better by day. This tells you the kind of investor trust and scope in the financial product. Coming back to Sharekhan Insta MF, basically, it is a 100% online Mutual Funds Account that does not require any paperwork whatsoever as far as opening is concerned. You just need to go to the website of Sharekhan, look for Insta MF facility, put in your details and submit those to the backend team of the broker. The account opening process requires you to enter specific details such as PAN Card, Aadhaar number and related documents. Furthermore, you are required to verify your contact information including your email id and mobile phone through OTP verification. 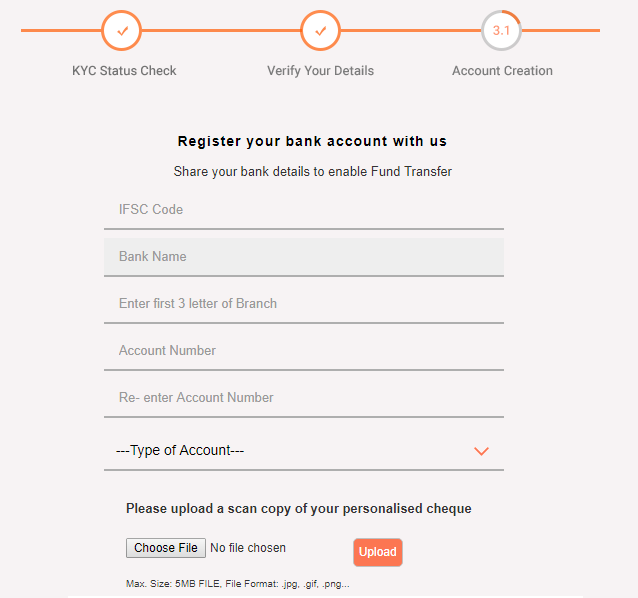 Lastly, in order to complete the formalities related to the Sharekhan Insta MF Account, you need to upload the scanned copy of your valid cheque so that your bank account can be linked with your mutual funds account for future monetary transactions. If the user is not KYC compliant, then the service team of the broker assists the user in getting complaint first and then goes ahead with the process. Once you are done with these formalities, the backend team verifies the details, possibly calls you back in order to confirm the information and then, activates your account for mutual funds investments. In case you are looking to invest just in the mutual funds’ segment, then this account will do for you and there is no need to open any Demat account further. Before we talk specifically about the features of Sharekhan Insta MF Account, you need to understand that the whole online mutual fund investments space is getting competitive. Well, you have options such as 5Paisa Auto Investor, Zerodha Coin, Angel Broking Wealth and more of such stimulating investment applications these days. Sharekhan Insta MF definitely enjoys the huge brand equity created the full-service stockbroker and that is one of the biggest differentiating factors for this product as well. 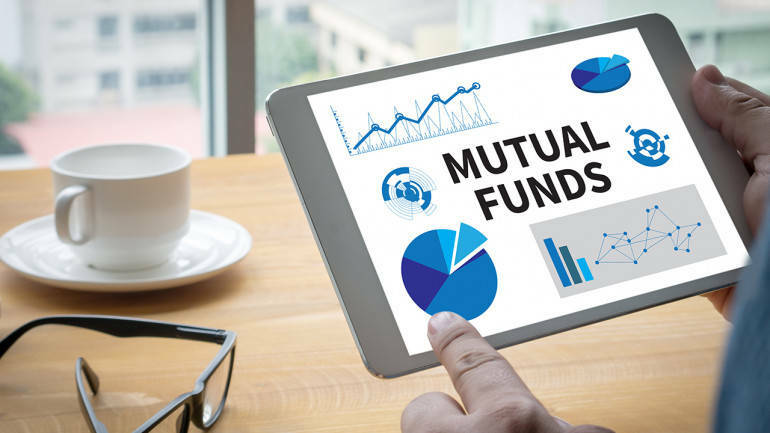 The complete account opening process for mutual funds investment is online in nature and does not require any manual intervention. This is applicable, assuming you have the necessary documentation (as explained above) ready with you. Users who end up opening this account can use Sharekhan Neo facility, which basically is an automated mutual fund recommendation engine. 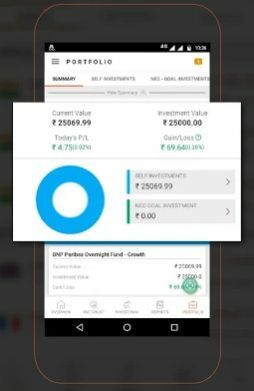 Based on the risk appetite, investment capital and a few other factors, Sharekhan Neo recommends few mutual funds and then you can invest in those funds using this Insta MF Account. Apart from Sharekhan Neo, you may choose to use the recommendations provided by the research team of Sharekhan. However, it is suggested that you perform your own analysis before investing your hard earned capital into any investment product. Insta MF users can choose to invest in any of the 19 AMCs (Asset Management Companies) Sharekhan has empanelled with. Although, the broker is looking to get other AMCs onboard as well. Depending on your preferences, you may choose to invest through Systematic investment plans (SIPs) or through lumpsum payments in a single go. In case of any queries or concerns, you can get in touch with the customer support team of Sharekhan through Phone, Chat or Email. Connectivity issues observed, especially if you live in a smaller city or town. Mutual Funds analytics information not available. Let’s check out the complete process of Sharekhan Insta MF account opening in a step by step format. 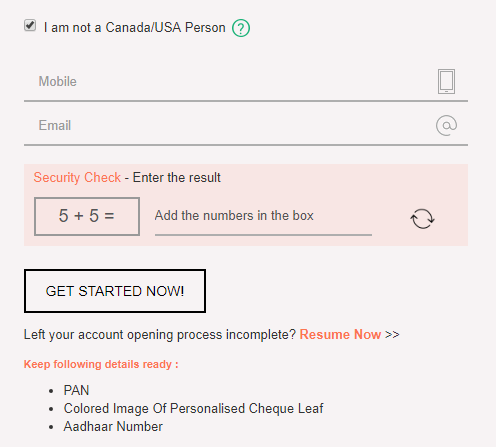 You are required to provide a valid email id and mobile number. The entered mobile number will be verified through an OTP in this step. You are also notified of the kind of documents you need to complete the process. 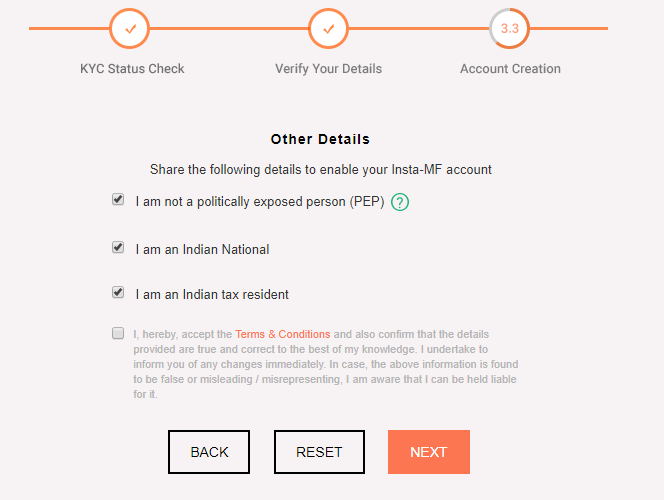 First up, the user is required to validate whether he/she is KYC compliant or not. In case the user is compliant, then the process becomes even shorter. Otherwise, the process becomes a bit longer in terms of getting the details verified. 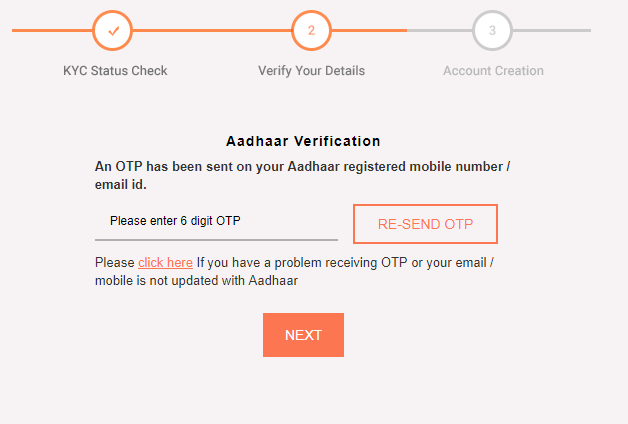 This is the Aadhar verification step where the OTP is sent to the registered mobile number of the Aadhar number mentioned in the previous step. You are required to enter the OTP in order to complete this step. 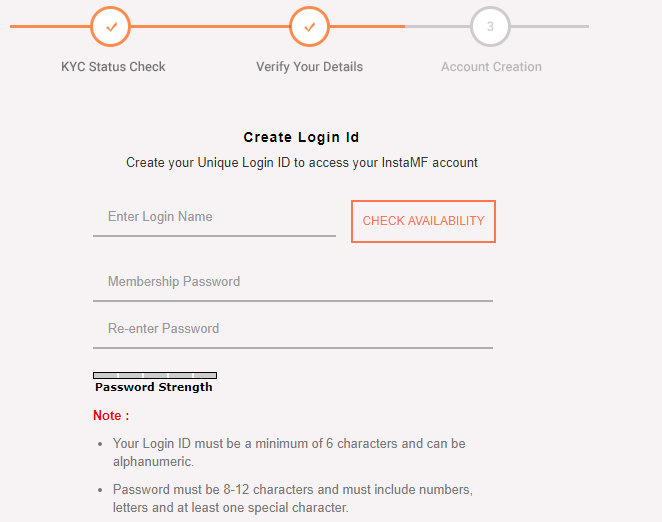 Once verified, you need to enter a login name that you will be using for Sharekhan Insta MF application. Along with that, you will need to set-up a password for further usage here. Here bank account details are taken so that later you can easily transfer funds from and to the Sharekhan Insta MF account. You are also required to upload a scanned copy of a bank account cheque although, you may choose to provide the cheque later as well. 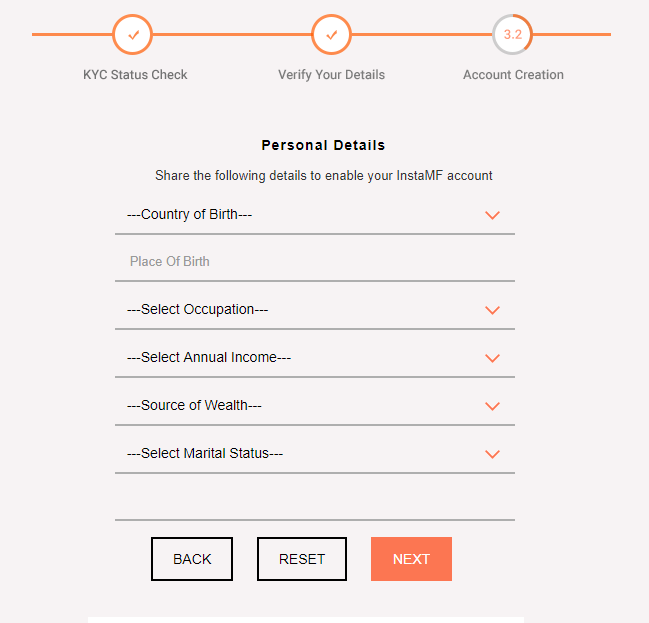 Basic KYC details are required to be entered in this step that are related to your personal and professional life. Basic validation is done in this step where you confirm some relevant details needed to open an investment account in India. 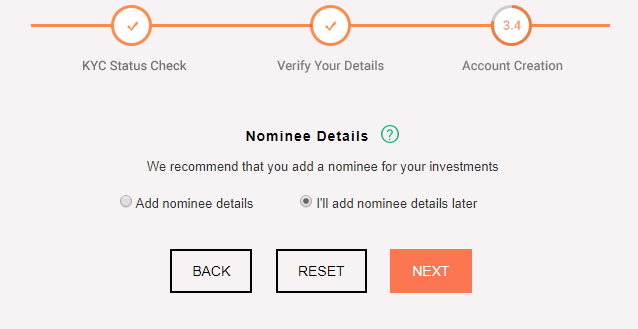 It makes sense to add a nominee in your account. However, you may choose to add a nominee later sometime as well, even after your account is activated. Finally, you need to set up a trading password (that must be different from the membership password set in step 4). 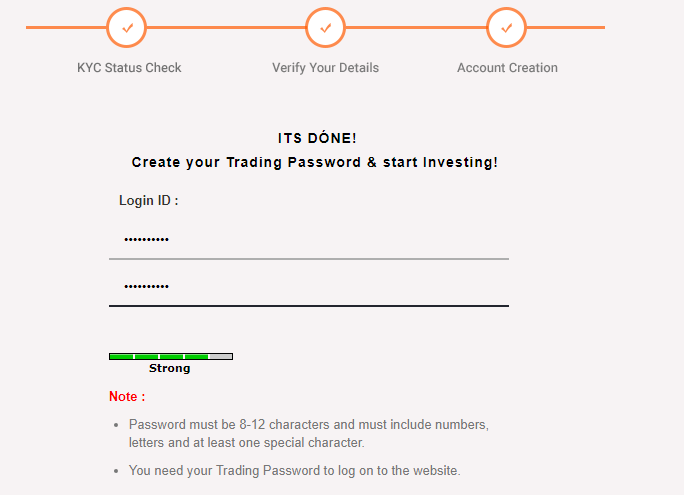 This is the password you will need to place an order using this Sharekhan Insta MF account. This wraps up the complete account opening process and you will not need any manual or human intervention at any point in time during this complete process. 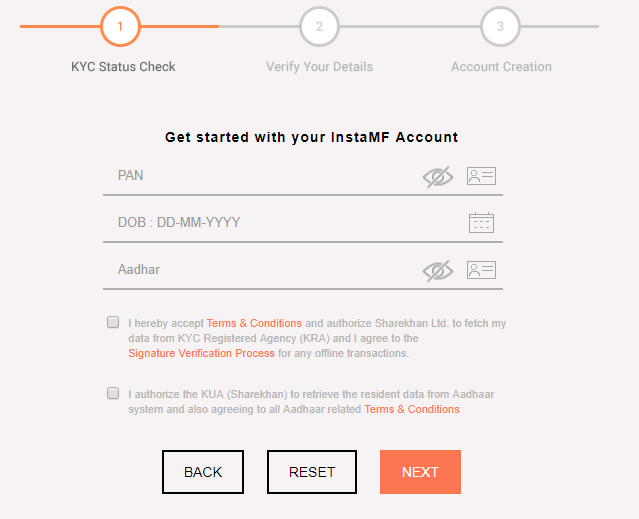 A quick and easy process, especially for users who are KYC compliant. Research assistance from the advisory tool Neo and the research team of the stockbroker. You are allowed to pick and invest in any of the 19 AMCs listed by the stockbroker. These 19 AMCs, as per Sharekhan, cover 80% of the overall mutual funds base. Different communication channels open for customer support in case of any concern or queries a user might have. Sharekhan research is one of the good performing ones and can be trusted to an extent. Other highly competitive options available from stockbrokers such as 5Paisa, Angel Broking, Zerodha etc. (as mentioned above). The automated robo-advisory tool Sharekhan Neo is relatively new and still needs to prove itself before clients can put their trust into it for their investments. No offline assistance for clients looking to use Sharekhan Insta MF and only online channels are there to be availed. So that is it! As far as this review of Sharekhan Insta MF is concerned. Do you want to get started with investments and need any help in opening your account?